Alaska frozen fresh seafood maximizes sustainability, availability, and flavor of fish and shellfish supply. Chefs Dustin Trani and Drew Johnson "slack it out" teaching C-CAP students how to properly prepare frozen fresh Alaska seafood. Ever heard of cryogenic or blast flash freezing? This process helps to preserve seafood at the peak of freshness. “Flash freezing is able to prevent damage or breakdown of proteins and lipids, two major things we need to keep in our seafood in order to preserve quality,” Michael Kohan tells a class full of culinary students. Kohan is the technical director for Alaska Seafood Marketing Institute (ASMI) and flew down to Long Beach, Ca. to help educate young students participating in a culinary training organized by Careers through Culinary Arts Programs (C-CAP). In these trainings, like the one featured in this episode of On Foodable Side Dish, mentors like Dustin Trani, Executive Chef for J. Trani’s Ristorante in San Pedro, Ca., and Chef Drew Johnson of Kincaid Grill located in Anchorage, AK, come together to give back and share their wisdom with the future generation of culinary professionals. The hands-on trainings, like the one hosted in Long Beach Community College, expose students to different cooking techniques and role models in the culinary community. This time around, the students had the opportunity to learn about two species of Alaska seafood, how to best care for and prepare frozen fresh seafood, along with tips about dish development, plating, and dish presentation. “It gives you an opportunity to see not only the restaurant side of it, but also the competition side,” said Chef Trani, a C-CAP alumnus himself, about the opportunities offered by the organization. “C-CAP offers the competition side to win scholarships and really mentors these young chefs into their futures and future careers…,” he clarifies. 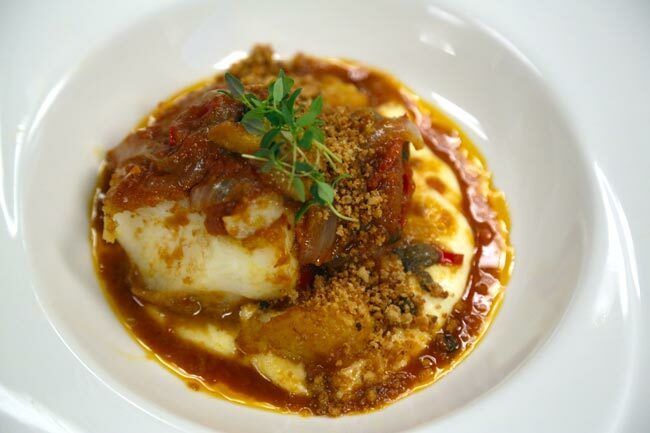 Tomato braised Alaska frozen fresh Pacific cod over semolina polenta. Accents include toasted bread crumbs, chive oil, and thyme herbs. 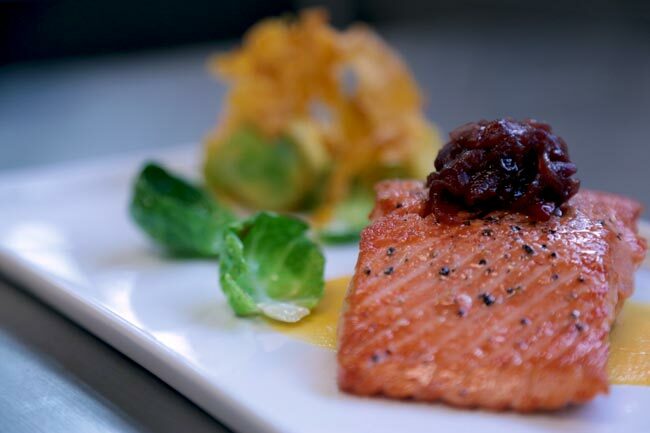 Alaska frozen fresh sockeye salmon with a butternut squash puree, sauteed Brussel sprouts, and butternut chips. Foodable was intrigued by the process and effects of freezing technology used in Alaska to preserve the quality of food. Not only is Alaska known for its commitment to sustainability, with fishing methods anchored in strict conservation practices as detailed in their state constitution, but it is proud to showcase both fresh and frozen fresh seafood. We decided to sit down with ASMI’s Seafood Technical Director, Michael Kohan, to learn more about the two alternatives! Foodable: Harvesters of Alaska seafood offer both fresh and frozen seafood. Why is frozen seafood just as good as fresh seafood? Michael Kohan: With new advances in freezing technology and quality handling practices, harvesters and processors are able to preserve seafood at the peak of freshness. Foodable: What is the official definition of fresh seafood in the industry? MK: The industry adheres to FDA guidelines which state that ‘fresh’ implies that the food is unprocessed, which means that the food is in its raw state and has not been frozen or subjected to any form of thermal processing or any other form of preservation. Foodable: Would you say freshness can be frozen in time? MK: Yes! Freezing fish directly after harvest essentially pauses the natural process of spoilage. The quality of fresh seafood is like a melting ice cube, the quality cannot be improved, only maintained. Freezing at an ultra-low temperature quickly stops the process of omega-3 oxidation and protein breakdown; actions that contribute to spoilage. The high quality nutrients are locked into the seafood to deliver that fresh-caught flavor and nutrient-packed product up to 12-18 months after the seafood was caught! Foodable: How much time, from the moment a fish is out of the water to the moment it is put in a freezer, does a fish spend in seafood facilities after harvesting, before it is taken frozen to be distributed? Does it depend on the species of the seafood? MK: The Alaska seafood industry is diverse and dynamic. The 80 different commercial species harvested are wild. The amount of fish, the timing of harvest and the type of harvest is different for every species and every year. For example, within the salmon industry, there are five different species and three different harvest methods. Each permitted harvester fishes in different areas and at different times of the year following sustainable management practices and the natural dynamics of the environment to find the wild fish. The complexity of the fishery doesn’t cater to a prescribed drop-off time. Harvesters are committed to delivering high-quality fish and do so by either freezing fish on board their boats or delivering fish to shore-based facilities to be frozen directly after harvest. Foodable: Does the taste or nutrition value change if the seafood is fresh or frozen? Does it vary from one fish species to the next? What about for shellfish? Would you say frozen seafood actually tastes fresher? MK: Every species is different, with fatty fish, such as salmon and sablefish, being more resilient to freezing practices than other species. Some shellfish species, specifically crab, are cooked before frozen because of the different meat qualities. Generally, frozen fresh seafood offers a way to enjoy that fresh-caught taste and receive the benefits of eating a meal high in omega-3 fats and protein content. Foodable: What are the recommended cooking techniques when handling frozen seafood? How do the different cooking techniques affect the texture of the fish? MK: The slower the thawing method the better moisture retention and therefore taste and texture. However, it is hard to remember to get frozen fish out of the freezer the night before or the morning before, so there are multiple ways we recommend thawing frozen fresh Alaska seafood. Most thaw time: Place frozen seafood in a clean container to catch the liquid. Cover container with plastic wrap. Place frozen seafood in the refrigerator overnight or let sit for 12-24 hours until thawed. Some thaw time: Place frozen seafood in a plastic bag. Submerge seafood in COLD tap water. Change out water every 30 minutes until thawed. For a small salmon fillet, the approximate thaw time is two hours. Least thaw time: Cook frozen…. Check out the ASMI Cook it Frozen guide for tips and techniques!